The purpose of this article is to summarize new facts about the flight of Vostok to see if this new information gives a new perspective on the flight. The location of both the VHF and HF ground stations are now known. They can be compared with in-flight voice contact transcripts. The text of the de-briefing of Gagarin after the flight is also available and provides interesting information. I have tried to give a synoptic view of how the flight proceeded by using an annotated map of the ground track. An attempt to understand the attitude control system of Vostok is also made. We now know the locations of tracking stations and ground communications stations for the Vostok flights and the Sputnik test flights proceeding them. The communications system with Vostok was based on VHF communications (143.625 MHz) but also on short-wave communications using strong transmitters belonging to the USSR Ministry of Communications. The dependence on HF was necessary, because the Soviet Union did not yet possess an ocean-going fleet of tracking ships. In particular for the Vostok flight, the spacecraft flew over water from the moment it left Soviet territory until retro-fire, so even if there had been VHF ground stations on foreign soil, they would not have helped, and the lack of tracking ships therefore forced the use of HF. As we shall see below, the HF system worked, but perhaps not brilliantly. The HF frequencies used during the flight were 9.019 MHz and 20.006 MHz for AM voice and 19.995 MHz for the simple on-off keyed telemetry. "...the commission accepted my proposal about the organization of control points for the flight in Moscow (TsPUP), Tyura-Tam, Novosibirsk, Kolpashevo, Khabarovsk and Yelizovo (Kamchatka). Moscow will have shortwaves and VHF communications with the spacecraft (if it makes more than one orbit), Tyura-Tam, Kolpashevo and Yelizovo will have VHF only, but Novosibirsk and Khabarovsk only shortwaves. Radius of contact for shortwaves is 5000 km and 1500 km for VHF. These radii thus far have not been practically checked and it is not yet certain that communications will be reliable, especially during the phase between launch and orbital insertion. At every KP (Command Point) there will be a KP chief, a communications officer, a cosmonaut, a doctor and a representative of the Ministry of Communications. ..."
The Vesna station in Alma-Ata has been added to the station network of Sputnik-9. The reason that we know that the designation Vesna-2 stands for Khabarovsk is the following entry for the 16 August 1962 in the diary of N.P. Kamanin's (1): ".....During his flight Nikolayev reported about the radio communications: The communications worked well and was stable all the time. The best of all worked Vesna-2 (Khabarovsk), Vesna-1 and Vesna-6....."
Since the music was transmitted to give Gagarin a chance to judge the chances of communicating with a particular ground station it seems that duplex was used. The map below gives the landing time as officially announced in 1961. We now know that touchdown of the descent module occurred at: 0748 UT and the touchdown of the pilot occurred at 0753 UT (7)..
During the launch phase Gagarin (Kedr) talks to Korolev and Kamanin up until 0615 UT. A Soviet recording company released a record with about one minute of noisy voice from Gagarin. It is possible to deduce that it is from the launch phase since Gagarin calls Zarya-1. Since the original recording was "propaganda" meant to be published and since the record has no copyright notice, I take the liberty of reproducing the recording here (168 kB mp3) (I have edited out the silent portions and filtered the recording for better audibility). Chris van den Berg has provided a translation and I have tried to correlate his translation to the transcripts in (2) and (3). "I understood that. I heard in the .......(unclear) ... worked very well. My general state is excellent. All is working well. I hear you loud and clear." " .. the flight is continuing well. I can see the earth. The visibility is good. ... I almost see everything. There's a certain amount of space under cumulus cloud cover. I continue the flight, everything is good." "All is working very well. All systems are working. Let's keep going!" "Zarya-1, Zarya-1, I can't hear you very well. I fel fine. I'm in good spirits. I'm continuing the flight....."
At 0617, Zarya-2 (Kolpashevo) calls Kedr. 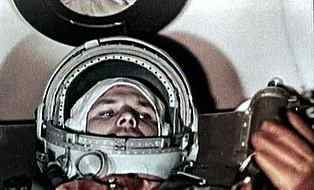 Gagarin gives a routine report:" The craft is operating normally. I can see Earth in the view port of the Vzor. Everything is proceeding as planned". Four minutes later he essentially repeats the report and then contact with Zarya-2 is lost shortly after 0621 UT. Then followed a three minute gap in VHF communications. "...the lights are on on the descent mode monitor. I'm feeling fine, and I'm in good spirits. Cockpit parameters: pressure 1; humidity 65; temperature 20; pressure in the compartment 1; first automatic 155; second automatic 155; pressure in the retro-rocket system 320 atmospheres...."
VHF contact was restored with Zarya-3 (Yelizovo) at 0625 UT. Gagarin asks for information about the flight: "What can you tell me about the flight? What can you tell me? "Obviously he is interested in what the telemetry shows about the status of the spacecraft and probably also about the orbit. The radio operator at Zarya-3 has not much to tell Gagarin: "There are no instructions from No. 20 (Korolev), and the flight is proceeding normally".Gagarin then says "Tell me your data on the flight! ", still worrying about his craft, but interjects a greeting to fellow cosmonaut Leonov, who was at Yelizovo: "My regards to Blondin (fair-haired man)". Gagarin keeps asking for data on the flight as his craft approaches the horizon at Zarya-3, but the ground has difficulty hearing him: "I feel splendid, very well, very well, very well. Give me some results on the flight!" Zarya-3 replies: "Repeat. I can't hear you very well". Gagarin comes back to say: "I feel very good. Give me your data on the flight!" After that VHF contact is lost with Vostok. "I am transmitting the regular report message: 9 hours 48 minutes (Moscow Time), the flight is proceeding successfully. Spusk-1 is operating normally. The mobile index of the descent mode monitor is moving. Pressure in the cockpit is 1; humidity 65; temperature 20; pressure in the compartment 1.2 .... Manual 150; First automatic 155; second automatic 155; retro rocket system tanks 320 atmospheres. I feel fine...". Shortly after he reported entering eclipse (0649 UT) and not hearing the ground, but Vesna heard him. At 0651 UT Gagarin reported that the sun-seeking attitude control system had been switched on and Vesna picked up that message also. "By order of No.33 (Kamanin) the transmitters have been switched on, and we are transmitting this: the flight is proceeding as planned and the orbit is as calculated." This message is repeated a minute later and Gagarin acknowledges the message. 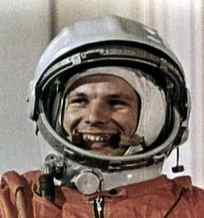 Gagarin kept transmitting his reports at 0704 UT, 0709:15 UT, 0718 UT, and 0723 UT, but they were not picked up by ground stations. Only a brief transmission was picked up in Moscow at 0713 UT: "I read you well. The flight is going...". I have tried to find description of how the Vostok attitude control system and how the orientation for retrofire was performed. The accounts in (3) and (4) often refer to the sun-seeking attitude control system. Interestingly, it was switched on at 0651 UT, 16 minutes before exit into sunlight. To me this seems to indicate that the spacecraft first found the local vertical and then found the sun after exit into sunlight. Exactly how the earth-sun acquisition was made is unclear. However, the sun sensor must have had the capability to be programmed with an offset angle depending on the position of the sun in relation to the orbital plane and the desired retrorocket thrust vector direction. The figure below shows that the sun vector was quite far from the orbital plane. Another possibility would have been to use ionic sensors to provide a yaw reference. In such a case the sun would not have been needed as an attitude reference. However, I think that the ionic sensors were first flown on Voskhod-1 and its test flights. Therefore, Vostok was forced to rely on an an earth-sun attitude reference system. Kamanin, N.P., Diaries, entries for 6, 9, 23 March 1961 and 16 August 1962. Translated by Chris van den Berg. Plaster, Henry G. "Snooping on Space Pictures", Studies in Intelligence, RG 263, Entry 400, "Articles From Studies in Intelligence, 1955-1992",National Archives and Records Administration. Memorandum of D.F. Ustinov, K.N. Rudnev, V.D. Kalmykov, and other to the CPSU Central Committee on the status of the first manned spaceflight, dated 30 March 1961, published in Izvestiya TsK KPSS, No. 5, 1991, pp 101-105. According to information relayed by Igor Lissov in April 2011.